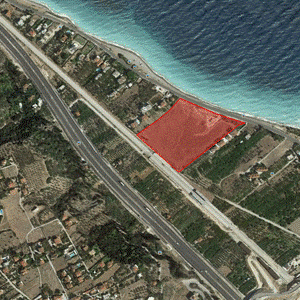 The plot of land is located on the Diminio coast which belongs to the Municipality of Sykion in the Prefecture of Corinthia, Peloponnese with a total area of ​​34,680 m2, of which 27,326 m2 are within the boundaries of the urban area plan. The property is suitable either for a resort establishment, a residential complex or a combination of the two. Its position is privileged and the view towards the Corinthian Gulf is unique. The “Diminio” Urban Railway station is located adjacent to the southern side of the plot.